In honour of the 50th Anniversary of Tim Hortons®, I wanted to share this story from Firefight about how important our Timmies was to us while deployed in Afghanistan. The coffee was a comfort and the symbolism of Tim Hortons was even more important as it helped us remember our lives and loved ones back home in Canada. “Anytime we could get it in Afghanistan, Tim Hortons coffee was our extra special treat. When I was at the main base, I was always amazed at the number of people from other countries who queued up for our good Canadian coffee. For us, it was our lifeblood and a connection to home. I explained that the gun looked like it had seen better days, but that I had kept the inside of it immaculate according to specs. I broke the gun down to show him. He laughed and said he admired my dedication to regulations and the care of my gear. Once we both had our cup of “Timmies” in hand, we struck up a great conversation including tales of combat. There’s nothing quite like coffee to encourage the sharing of stories and to make people feel more connected. Due to my role as a PSYOPS specialist, I often travelled from the main base to forward operating bases throughout the region by helicopter and with an unusual degree of autonomy. This allowed me the privilege of being able to bring some of the comforts of home with me to the troops in those remote areas. I would bring mail, cigarettes, food or special orders such as razor blades. One thing I always brought was a tin of Tim Hortons coffee. I was usually flying in on a CH-135 Chinook with two door gunners and a rear load to help get our gear onboard. The chopper might stop at two or three different locations before I would get off at my forward operating base. Sometimes, I would make a drop at these bases too. We would radio ahead to a contact there letting them know we were coming. Just like a scene from a television commercial, we would land with sand flying all around us. I would stand at the end of the loading ramp, holding tightly onto my chest rig so it wouldn’t blow off, and throw the tin of Tim’s down to our waiting buddy below. Coffee Break is an excerpt from Firefight ©2014 By Rick Kurelo, CD. 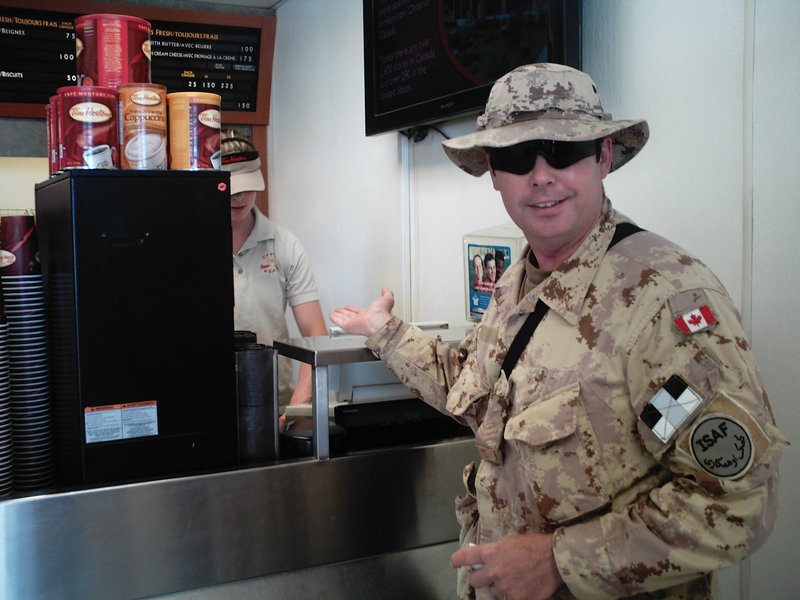 Photo: Rick Kurelo visiting the universally popular Tim Hortons at Kandahar Airfield, Afghanistan, 2008. This entry was posted in Afghanistan, Canada, Canadian Armed Forces, Firefight, FriesenPress, Tim Hortons by RickKurelo. Bookmark the permalink.